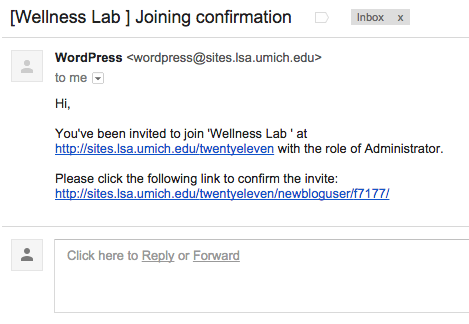 Our WordPress multisite network uses the Shibboleth Plugin to authorize new Umich users in the network upon signing in. The person logging in uses their uniqname and kerberos password as their WordPress login credentials and their user profile is created automatically. WordPress Multisite is set up this way for security reasons and to be compatible with UM’s network. This allows for a single sign on when using UM web resources. For example, if your are in one browser signed in to your UM gmail account and then open another tab to log into your WordPress site, you will automatically be authenticated and logged into WordPress. Have the new user log into the site by clicking your log in link (often this is found under “Meta” on the homepage sidebar). Alternatively, you could direct the new user to log into the main WordPress site (log in link is on the homepage under Meta or click here). Either way works. Once they log in then you, or another site administrator, will navigate to your sites dashboard. Select their User Role. More on user roles here. 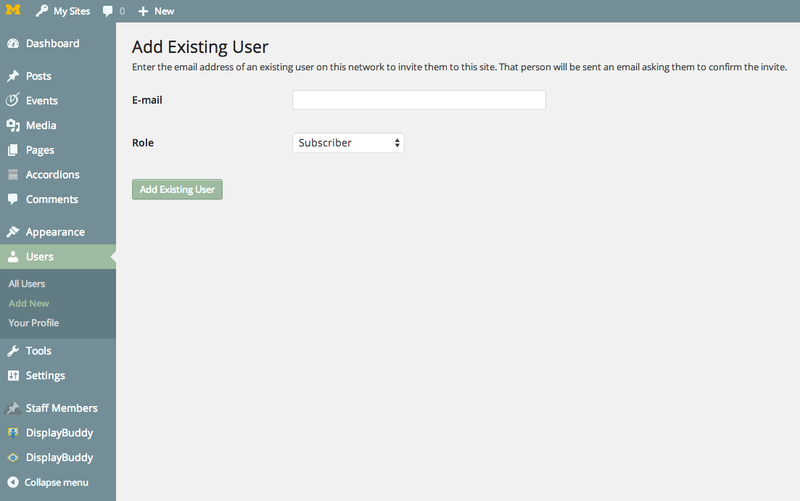 The new user will receive a confirmation email with an activation link. Once the link is clicked they will have access to the site. The new user can refresh their browser and will be able to access the sites dashboard. Quick Note: You will see the main network WordPress site in your dashboard under “My Sites” clicking into the dashboard will bring you to your profile page. * Email lsa.web.support@umich.edu if you need to add a new user that does not have a uniqname. Previous PostEvent Calendar Issue Resolved!Next PostNot quite sure what to put on your site?